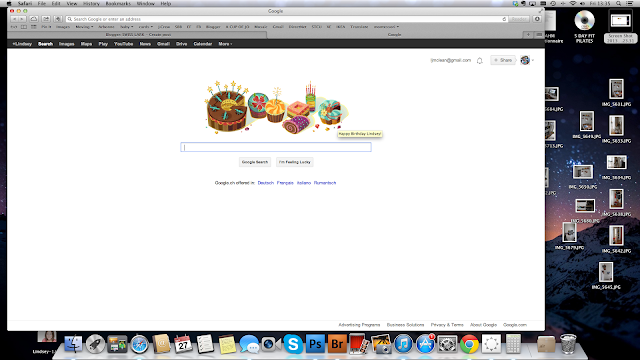 Did you know that Google remembers your birthday? If you're signed in it creates this cute little montage of cakes for your birthday and if you hover over it, it says "Happy Birthday, Lindsey!" or rather, your name if it's your computer and your birthday. Cute! So, I'm in a bit of a Catch-22. This month, after all the hemming and hawing we've done, we took the plunge and started trying for baby number two. Then smack in the middle of the "two week wait" between ovulation and either pregnancy or period, I got some bummer news from the doctor. Back in high school, I had surgery on my right ear and this past Sunday it started acting up again. I went to have it checked by an ENT yesterday and thought it would be a quick appointment and a total waste of their time. Then I ended up being there two hours, getting a hearing test and having multiple doctors check my ear. They think I might need surgery again and want me to go in next week for a CAT Scan. I just got a letter in the mail today that the CAT Scan's already scheduled and they've asked me to have my records from Portland sent over for them to review. However, if I'm pregnant, then they won't send me in for a CAT Scan and I'll have to wait the better part of a year to resolve the ear problem. It's awful; I've been so excited about getting pregnant. Now, part of me is I'm hoping that I am not pregnant so that I can get this all out of the way first. Oh God! Could the timing be more terrible?! My strategy for the moment is to practice deep breathing and focus on the positives. For example, I live in Switzerland where I have excellent health care and coverage. :) The doctors at the University Hospital clearly know what they're doing and I trust them and feel good in their care. :) Umm...Okay, that's all I can come up with for the moment, but that's still good. Deep breath in, long exhale out.